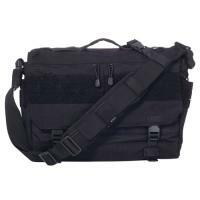 The RUSH Delivery Lima Bag from 5.11 Tactical is an extremely durable messenger bag with a few extra tactical features. Built from rugged, water-resistant 1050D nylon and equipped with Duraflex™ hardware and self-healing YKK® zippers, it can stand up to the harshest environments and toughest tasks. A non-slip, cross-body stabilizing strap keeps the bag secure during transport, while the ambidextrous design allows for convenient accessibility to items regardless of which shoulder it's slung over. The exterior features wrap-around webbing capable of supporting 5.11's SlickStick, Back-Up Belt System as well as ordinary MOLLE webbing. The high-capacity interior offers plenty of customizable storage options, making organization of gear and documents convenient. In addition to the roomy main storage area, the Lima contains a padded laptop sleeve for electronics, a quick-access admin panel for small items and a quick-draw compartment that provides rapid access to a concealed firearm. Dimensions (H x L x D): 11" x 17" x 4"